First Line:"I bear a deep red stain that runs from my left shoulder down to my right hip, a trail left by the herbwitch's poison that my mother used to try to expel me from her womb." 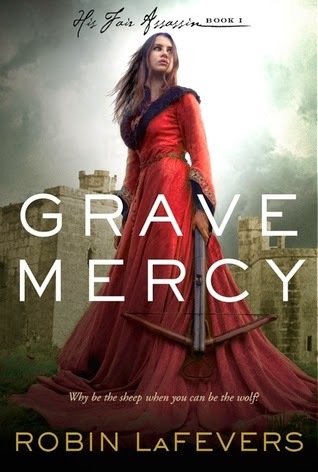 Review: I have been wanting to read Grave Mercy since it came out almost three years ago and I have just now gotten to it and it was pretty awesome. This first book is about Ismae who has led an already hard life and now come to find out she is one of Death's daughters and eventually due to some horrible crap she goes through she is rescued and sent off to the Convent of St. Mortain where she finds her sanctuary and is trained to become an assassin. Ismae was very likable and I loved seeing her grow throughout the book. When we first meet her she is a victim to a life of abuse but soon over the three years that she is at the convent she grows a great deal and really comes into her own and finds a strength in herself she never knew she had. I seriously really did love her character and what was more fun was seeing her interactions with Duval, who by the way was definitely a worthy love interest for her. He kept her on her toes as she did the same to him. There was a great deal of court life and court politics in Grave Mercy I personally loved it since I love to read the Historical Romance/Fiction genre and the fact that this book is Fantasy which is my favorite genre of them all I found all of it very entertaining and I was flying through the pages, but I can see someone who doesn't care much for politics getting quite bored around midway into the book. Overall I had a lot of fun reading Grave Mercy and I'll be reading Sybella's story Dark Triumph very soon.